The perfect thaw for freezing toes. 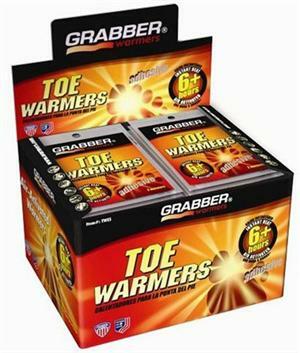 GRABBER Adhesive Toe Warmers are a non-toxic, environmentally friendly, odorless heat source using all natural ingredients that are non-combustible. Standard equipment for skiers, hunters, fishermen, golfers, campers or anyone working or playing out in the cold. Simply open the outer package and expose the packet to air. No shaking is necessary. Remove the paper backing and place the adhesive side of the Toe Warmer on the outside of the sock, at the top or bottom of the toe area to enjoy protection from cold toes for 6+ hours. Do not apply the adhesive side directly to the skin. Thin and comfortable with a rounded design, these function ideally in the low-oxygen environment of boots and shoes. Average temperature: 100°F (38°C), Maximum Temperature:107°F(42°C) when used as directed. Size: 3 x 4". Duration: 6+ Hours. Ingredients: Iron, water, cellulose, vermiculite, activated carbon and salt. CAUTION: Children, the elderly, the handicapped and those unable to remove Hand Warmer by themseleves should be supervised when using this product. Remove Hand Warmer immediatley if it becomes uncomfortably hot. If used incorrectly, higher temperatures may occur, causing burns. For EXTERNAL use only. Do not puncture Hand Warmer or allow contect to contact eyes or mouth. Consult physician if swallowed.